The first year’s final review begun cleaning the studio the night before .The next morning ,first group had finished to pin up their work as the guest critics, Soita wambete,Sierra Bainbridge, Garet gantner, and Alicia capelli arrived .They started with two-by-two as they gave them their comments. As the pin up progressed, the lunch time approached as well .But before we went for lunch, Dancilla,the representative of the COVAGA women weavers, one of the important guests arrived, giving some interesting critiques. After the presentations of a few more couple of groups ,we went for lunch . The second session began with new guest Killian Doherty, Thomas Berlanda, Nerea Amoros elorduy, as time went on, some of the students that had finished their presentation disappeared and others were busy trying to finish their work in the creative design studio. After the second session of the presentation, we voted for the top 3 students whose work was better and more comprehensive to be exhibited in the arcbox, within the exhibition “weaving transformations”. The voting process begun with the students picking the best student from 3 groups thought did the best work, afterwards the lecturers voted as well. 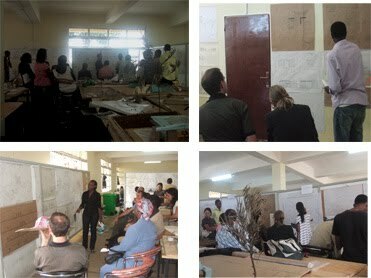 Later we all came up with three students: SHYAKA Aziz Farid ,INGABIRE Doren and KARAGIRE Christian .They were chosen as the representative students for our 1st year in architecture 2011 with the project of designing a bus stop for COVAGA in Gashora, Bugesera, Eastern province, which was not as obvious as it could seem. In brief, the project although at the beginning of the semester, things were not making a lot of sense (how to use and learn from the weaving techniques to come up with a bus stop) as time went on, students learnt a lot from the different weaving techniques. We really thank our lectures for the great lessons that we had together throughout the entire memorable 1st year of architecture.